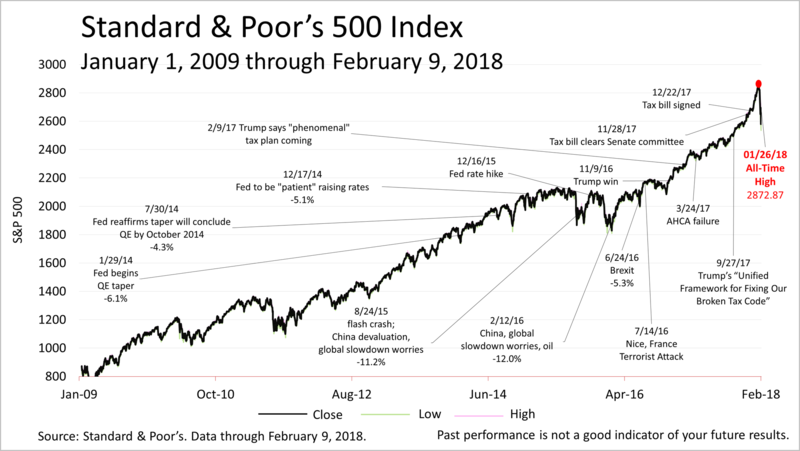 From its all-time closing high two weeks earlier, investors on Friday had corrected their valuation of stocks in the Standard & Poor's 500 index by 11.8% before rallying about 3% and closing at 2619.55. From the all-time closing high of 2872.87 on Friday, Jan. 26 to Friday's low at 1:39 p.m. EST of 2532, stocks had more than met the definition of a "correction" and the plunge entered financial history books. It's understandable that investors have revalued stocks. Upward revisions recently made to an already extraordinary earnings growth made some investors giddy. 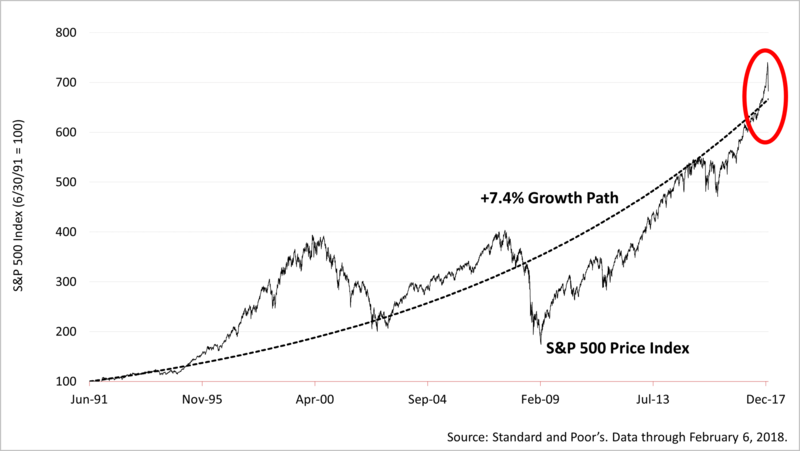 The curved black line shows the 7.4% earnings growth path and the jagged black line is the performance of the S&P 500 long-term. In recent months, stock prices spiked way above the long-term trendline because earnings expectations surged. Here's a look at the surge in earnings expectations, with historical context. 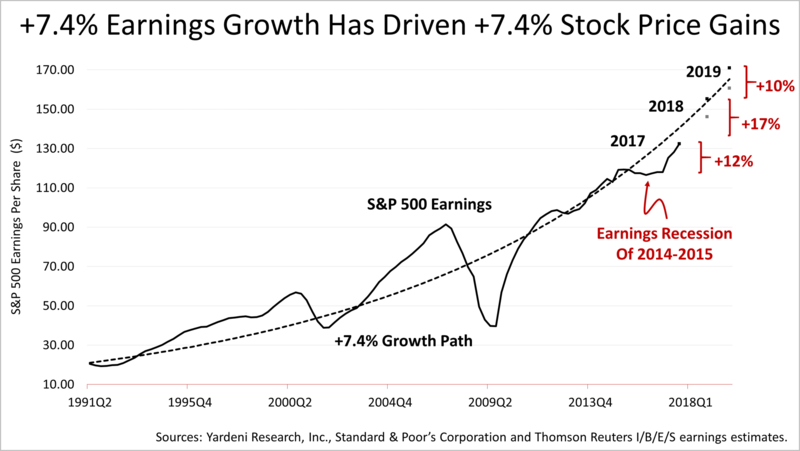 Since 2001, earnings on large-company stocks have been on their longstanding growth trajectory of 7.4% annually and that has driven gains of 7.4% annually. But earnings are not expected to grow a mere 7.4% annually in 2017, 2018, and 2019, but rather by 12%, 17% and 10% respectively. That's the latest estimate from Wall Street analysts and it's up significantly from only a few weeks ago. To be clear, when the new tax law was signed, the average company in the S&P 500 was expected to see profits of $131 a share in 2018 but that was revised to about $152 and could be boosted again in the weeks ahead. That's why investors became giddy. 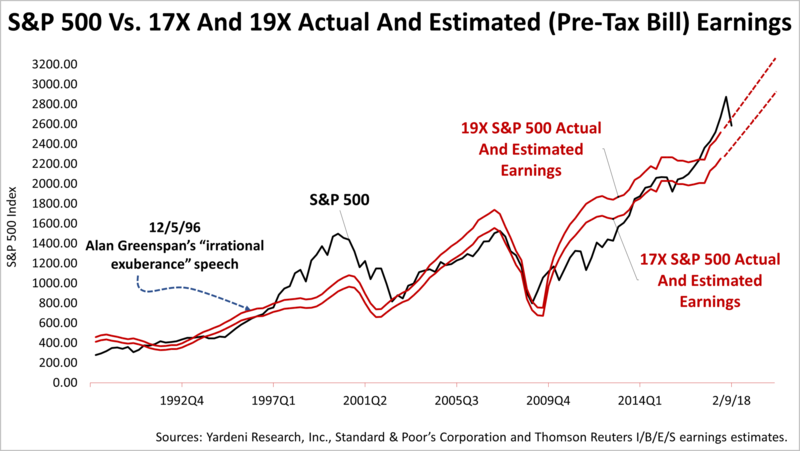 Historically, in a low inflation economic environment as we have been in, investors value a dollar of earnings in the average S&P 500 company between $17 and $19 a share. 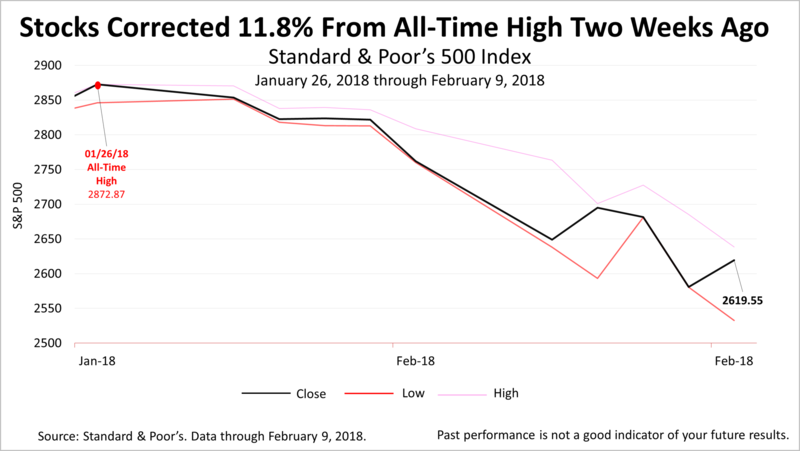 The black line surged out of the $17 to $19 valuation band but this plunge from the all-time closing high on January 26 has returned the price to within the historical valuation band between the red lines. We've mentioned in our weekly updates for months that a change in sentiment could cause a correction at any time and the current correction may not be over. Volatility has risen with investors spooked by rising inflation expectations, higher lending rates and growing concerns over the long-term U.S. debt. The S&P 500 closed Friday about 9% off its all-time closing high. Statistically, the chance of a bear market decline of 20% or more increases as the eight-and-a-half-year bull market grows older, and the new tax law increases the chance the Federal Reserve will make an interest-rate policy mistake by quashing growth or allowing the economy to overheat and inflation to surge. Fed mistakes caused every recession in post-World War II history. However, earnings drive stocks and earnings expectations have been surging, bolstered by the new tax law. With real wages continuing to grow, consumers are spending and consumers account for 69% of economic growth. Despite inflation worries looming larger, there is no sign of a recession and major economic indicators are signaling strength. So, despite the correction, the bull market and economic expansion could continue for months and head much higher. Standard and Poor's. Data through February 6, 2018. Compound annual growth rate. S&P 500 total return index. Per Professor Jeremy Siegel's seminal Stocks for the Long Run, first published in 1994. 2017 (estimated), 2018 (estimated) and 2019 (estimated) bottom-up S&P 500 operating earnings per share as of February 7, 2017: for 2017(e), $132.40; for 2018(e), $155.26 (was $146.19); for 2019(e), $170.93 (was $160.69). Sources: Yardeni Research, Inc. and Thomson Reuters I/B/E/S for actual and estimated operating earnings from 2015. Standard and Poor's for actual operating earnings data through 2014.